Fair Winds | So Many Exciting and Beautiful Places! 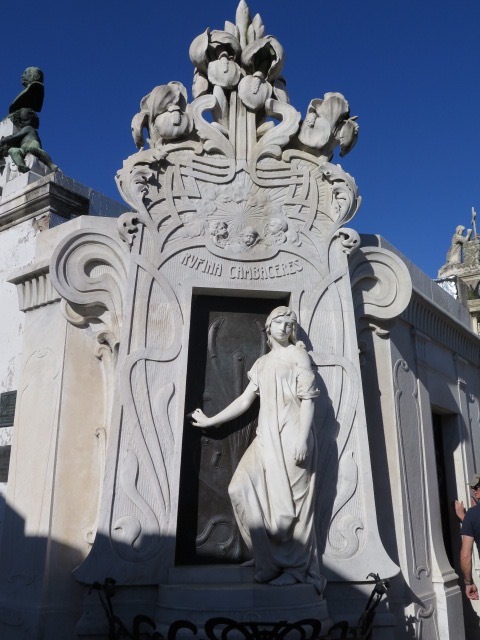 The original name for Buenos Aires was Real de Nuestra Señora Santa María del Buen Ayre (Our Royal Lady Saint Mary of the Fair Winds is my best guess. 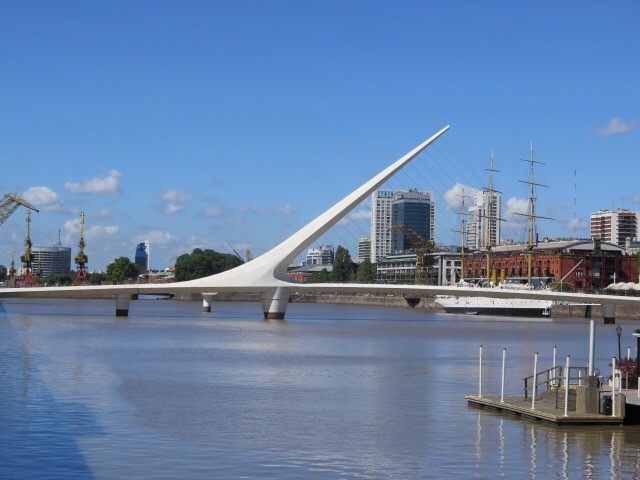 The city of Buenos Aires was founded in 1536 by Pedro de Mendoza, a Spanish explorer. It is the fourth largest city in the Americas, with a population of 3 million people. Our hotel, the Hilton, is located near the old harbor. There is a canal that was used for shipping in the past, but now is used mainly for recreation. 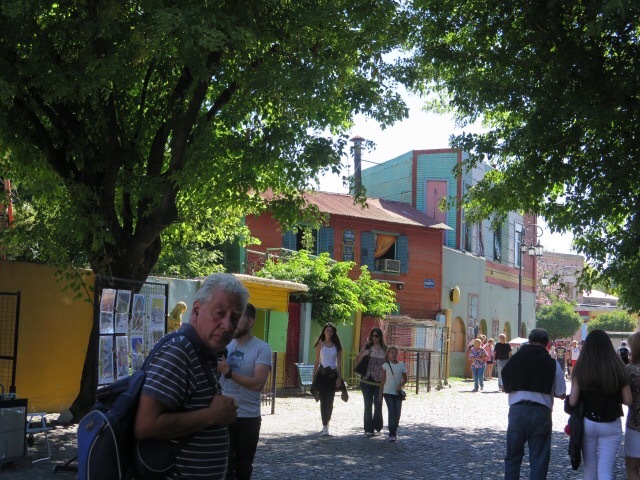 Many of the former warehouse buildings have been converted to shops and restaurants, and the area is now a promenade, with many citizens enjoying the beautiful day. There is a beautiful walking bridge cross the canal, Puenta de la Mujer (Women’s Bridge.) The design is supposed to represent a man leaning over a woman, doing the tango. 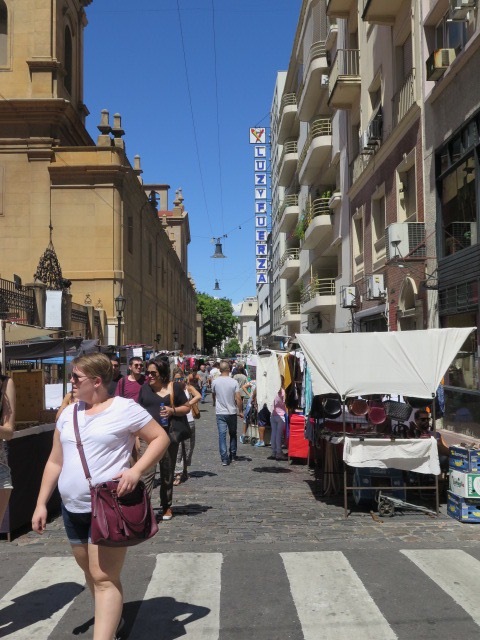 We spent the early part of the day at a Sunday market near our hotel. 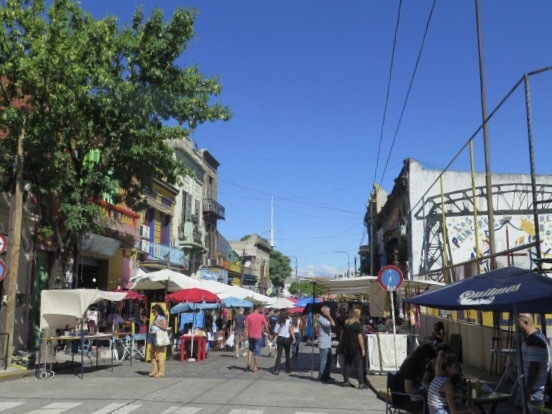 There are numerous such markets throughout the city, and they can stretch for blocks. You can purchase leather goods, trinkets, antiques, clothing, and on and on. 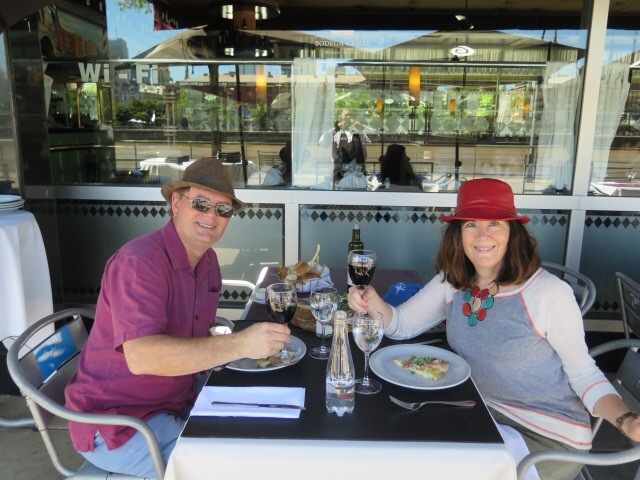 Mark and I snagged some leather fedoras, and we look quite snazzy as we enjoy our last lunch in Argentina. Between 1976 and 1983, many young people were “disappeared” during a corrupt military regime. Some of these young people were pregnant at the time. Once the baby was born, the mother was murdered and the child “adopted” by a military family. 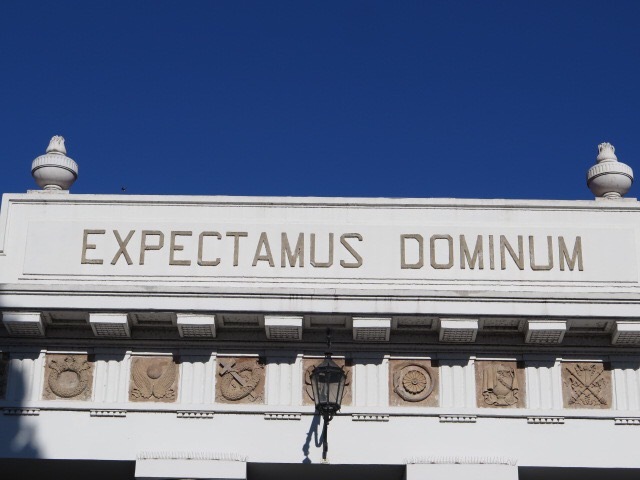 The group, Mothers of the Plaza de Mayo, was founded to try to find out what happened to their children and grandchildren. 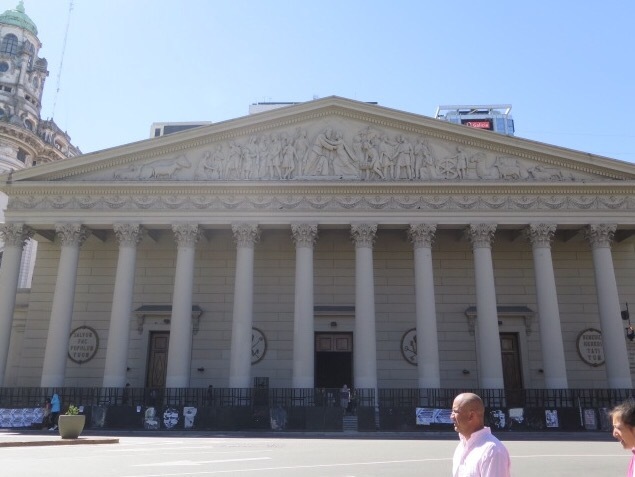 They protested at the Plaza de Mayo, across from Government House, trying to get some resolution. It’s estimated that 500 babies were stolen, and only about 1/4 have been reunited with their families to date. 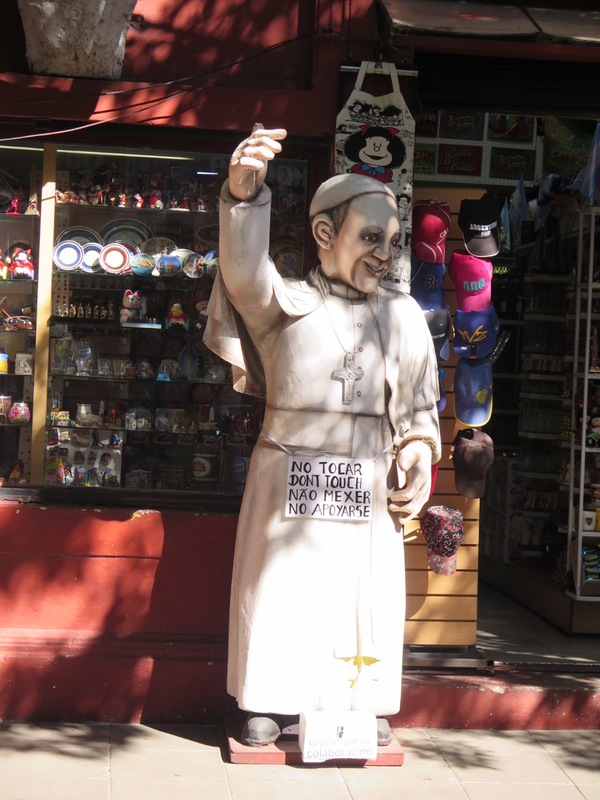 The street around the plaza is painted with “white scarves” as symbols of the grandmothers who marched here. 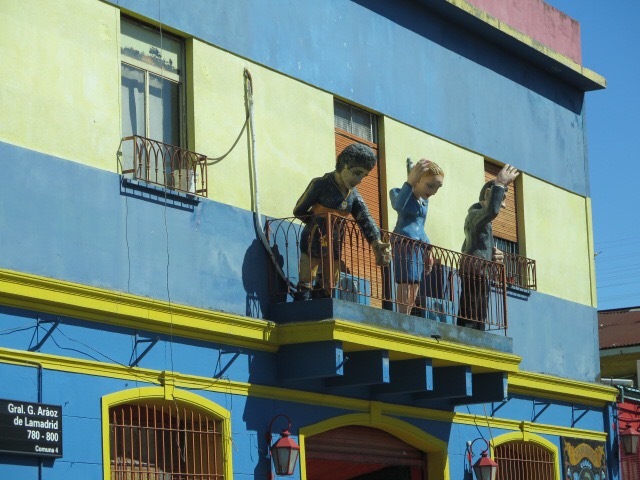 We spent a little time in the La Boca (the mouth) neighborhood, which sits at the mouth of the Matanza-Riachuelo River. Unfortunately, the river is contaminated by arsenic and lead from centuries of pollution. It’s a very poor neighborhood, overall. The area was settled by people from Genoa, many of whom worked at the old port here. 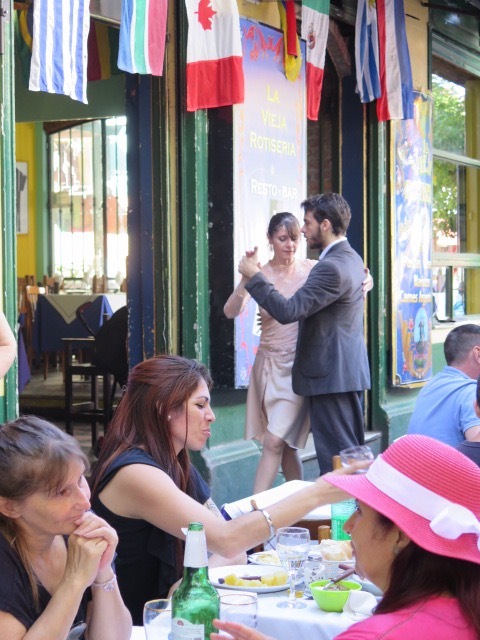 Tango originated in this neighborhood, originally danced by men together while they waited to visit a prostitute. After the tango became popular overseas, men and women began dancing it together. 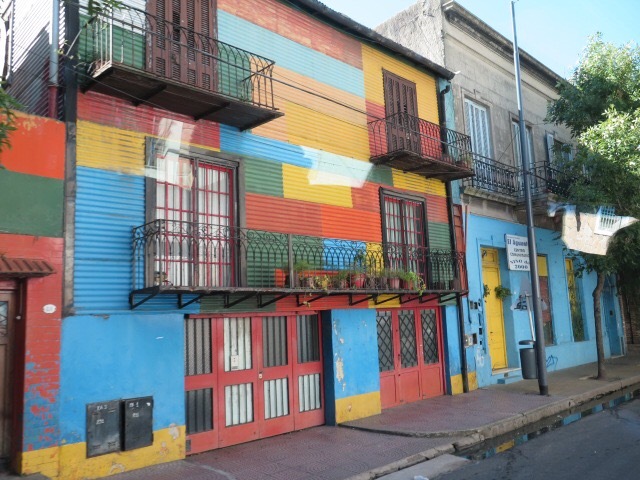 This is a colorful neighborhood. The immigrants who settled here couldn’t afford traditional building materials, so they used metal and wood from shipping containers at the dock. They also used the remaining paint after a ship was repainted, and that was rarely enough to paint the entire house, so many are multi-hued. 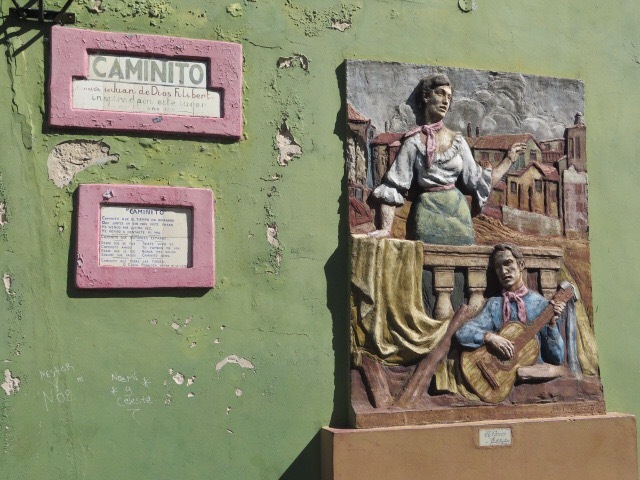 We walked Caminito Street, home to many artists. 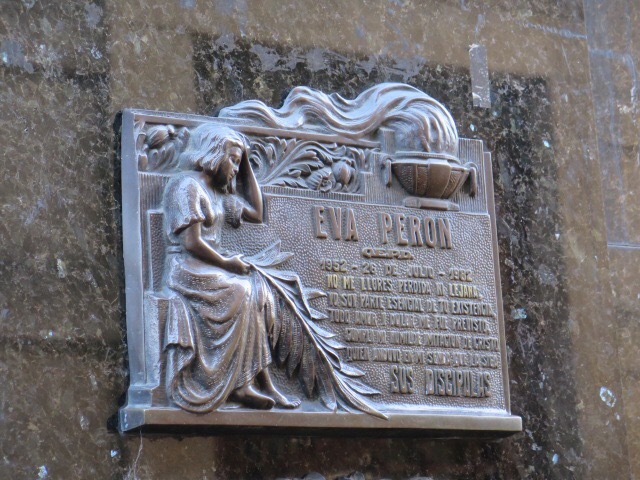 Our final stop was at La Recoleta Cemetery, the final resting place of many famous and/or wealthy people, including Eva Peron. 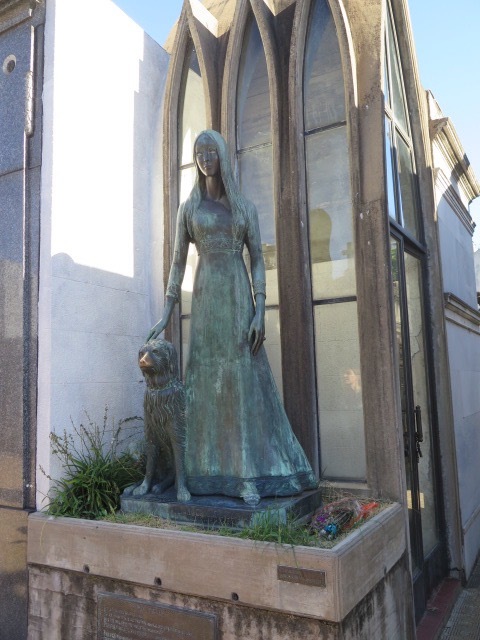 Eva was hated by the military, and after she died, they stole her embalmed body and attempted to hide it from the public. However, the people always found the location, and came to visit and leave flowers. 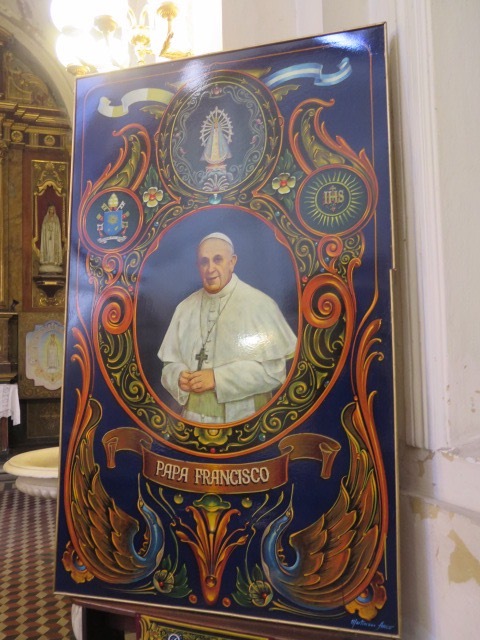 For almost 20 years, it was moved from place to place, then, with the assistance of the Vatican, to Milan, Italy. 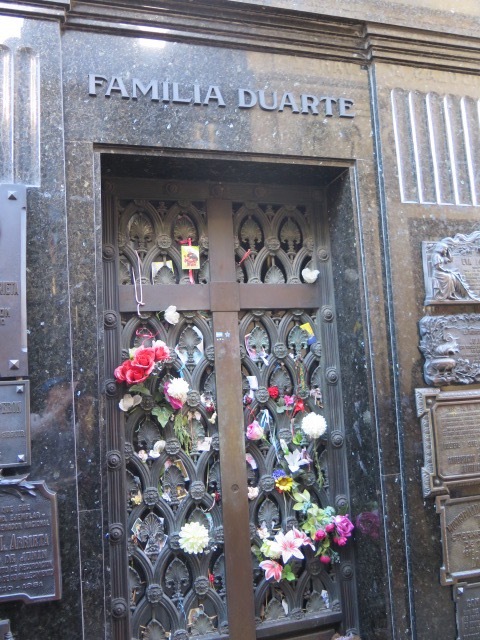 She was finally returned to Argentina, and is buried in her sister’s family mausoleum, the Duarte family. 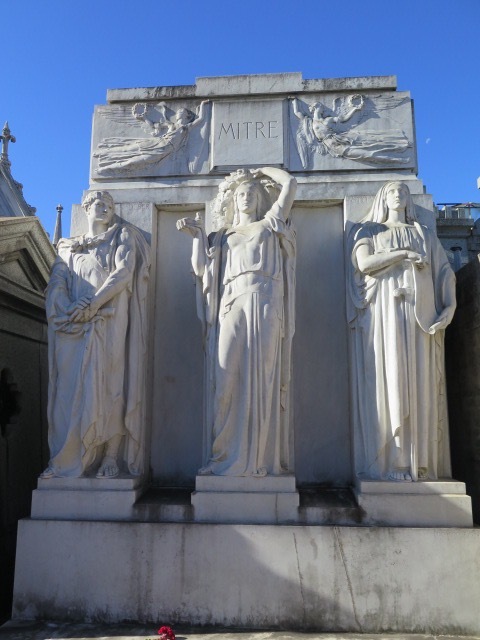 Mausoleums here can sell for as much as $150,000, although many are only $50,000. They can be very elaborate or quite simple, and can be as deep as almost 50 feet. It belongs to the family in perpetuity. They can be bought and sold just like houses. 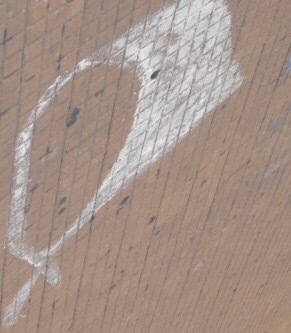 We noticed some that appear to be abandoned. If that’s the case, the cemetery tries to locate any remaining family members, who may not even be aware of the existence of the mausoleum. 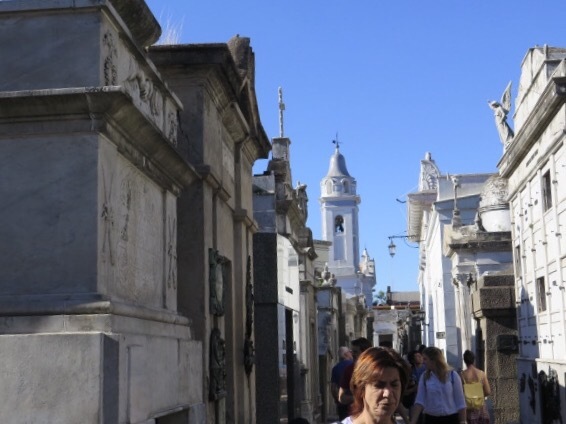 If no family members can be located, the cemetery waits another 20 years, then puts it up for resale. After a bit more touring, we returned to the hotel in time to catch our ride to the airport. An overnight trip brings us home on Monday morning, March 6. 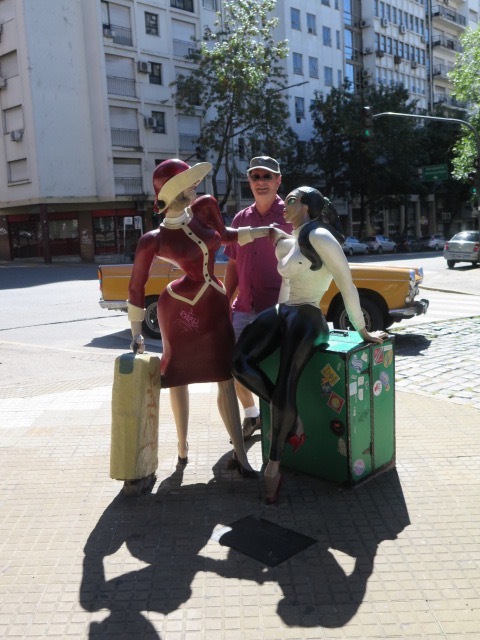 This entry was posted in Argentina, South America Travel and tagged Eva Peron, Evita, La Boca, Tango. Bookmark the permalink.